Shade sails combine the very best of both form and function. First, shade sails provide a great source of sun shade and UV protection. Second, they offer stunning aesthetics that are quite unique. 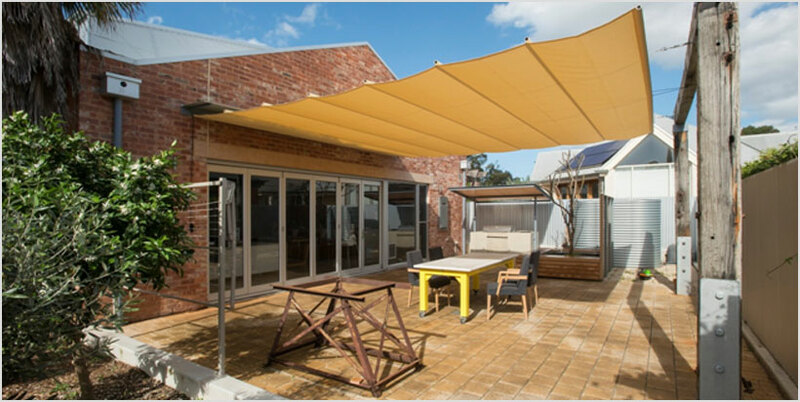 If you want to make the best use of your outside areas, installing a shade sail is a fantastic idea. If you are interested in installing a shade sail, or just want to gain a better understanding of how they are made, the following article is a list of important steps you should consider when designing and manufacturing a high quality Shade sail. The first step for creating a wonderful shade is to come up with a great design. We need to designate the exact area that needs to be covered and calculate how much shade is required. As far as layout is concerned, it’s a good idea to start off with a simple 4 corner Hypar shaped shade (shown below) and then experiment from there. All shade sails should have a certain amount of twist or shape in their design. This is done by designing the sail to have alternate high and low corners. Known as a ‘Hypar’, this shape increases tension in the shade, reduces flapping in the wind, and improves overall longevity of the sail. The beauty of a custom shade sail is that you can create almost any type of 3-dimensional figure your imagination desires. If you want to add posts and create a 5 or 6 post sail – that’s no problem! Perhaps you want to fix the sail to an existing structure, or use a rope-track? Or maybe you want to add extra sails for a layering effect!? With the ability to do all these things and more, you really can build some fantastic looking structures, using shade sails and shade-cloth fabric. 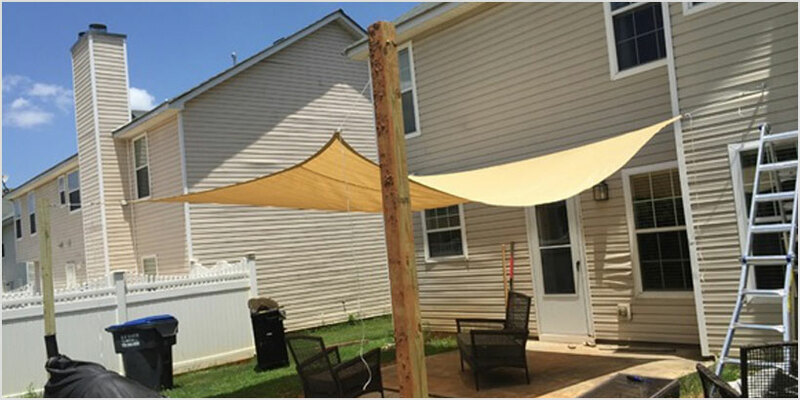 Shade sails are designed with hollow concave edges to help tension the fabric. Because of these hollows, a three-sided sail (triangle shade sails) will provide less than 50% of the effective shade than a four cornered sail. Also a triangle sail will always remain flat as it has no 3-dimensional shape. This makes a triangle sail prone to flapping and the pooling of water. Therefore, a triangle sail is not recommended. If the area that needs shading is right in the corner of two perpendicular walls, you may want to install a right-angle shade sail. Using two rope-tracks you can install a three sided sail without the need for any posts. This solution is quite economical, but it still isn’t ideal as the sail will be flat and prone to the issues described above. We suggest that if you want to install a triangle sail, such as in this instance, you keep the overall sail area quite small. 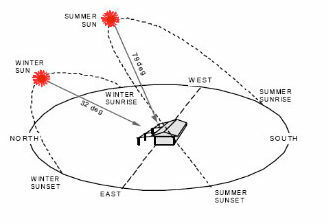 The direction of sunlight varies quite a lot, not only during the day but also from season to season. When designing your shade sail it is important to consider the path of the sun to determine the best place to position your cover. For example, if you have designed a shade that has ample cover during midday, it might not be the same case in the afternoon. To account for this variance in sun shadow, you can increase the overall footprint of the shade, or vary the layout so the shade is most effective when you want it. Going one step further, a solar study can be performed which depicts how your shadow and UV protection varies throughout the year. This will ensure the proposed shade will provide adequate protection. If you want the flexibility to control the amount of shade you want at any one time, then you need a retractable sail. Great for shade and added comfort in summer, the Shaderunner® Retractable Sail (see below) acts just like a fixed sail, the difference being you can retract it whenever you need. The option of pulling the shade back allows you to enjoy the outdoors during the cooler months or in the afternoon when the sun goes down. 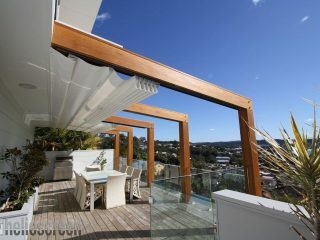 Retractable awnings also ensure your home doesn’t miss out on natural solar heating during winter. Running on stainless steel wires, the Shaderunner®​ is comprised of folding fabric panels supported on pulleys, and concertinas using a simple rope system. After 30 years of sail making experience, Shadeform have settled on a handful of fabrics, chosen for their superior quality. Each of these fabrics are selected on the basis of them having the best properties and overall value for money – for their type. Used in large sport stadiums across the world, Mehler PVC is a heavy duty structural fabric with 100% UV protection and Waterproof specification. Creating a long lasting all-weather covering, this particular fabric offers the longest lifetimes of all fabrics, still with a large range of colours to choose from.​ Manufactures warranty of 10 years. The smooth textures of Outlook Mode make this material very popular for residential applications. Including two tone colours, this textile doesn’t’t skimp on performance offering a high level of protection – 95% UV blockout. 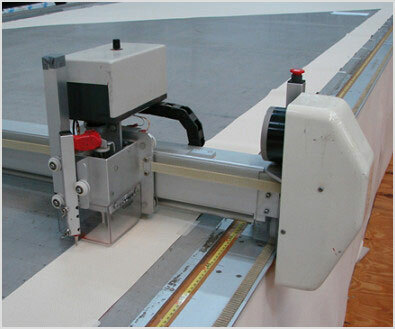 A Polyester mesh base allows welded seams, eliminating stitch breakdown and allowing easier maintenance and cleaning. PVC coated yarn completes the final layer of a long lasting fabric, including a 5 year warranty. Stronger than flat tape-yarn shadecloth, this monofilament fabric has a round HDPE yarn. Typical use in high wind environments and for large commercial sun shades, Monotec is the market leader in high performance shadecloth. Also, Monotec has a fantastic expected life time, with a manufactures warranty of 15 years! When selecting colours, you’ll find out rather quickly that there is a lot to choose from. Each fabric will come with a set of colour options (Outlook Mode shown below). It’s good to pick a few options first, then take physical samples out and view them in the actual area for the proposed shade. If you can’t manage this then selecting from a chart is accurate enough for most people. Lighter colour fabrics show dirt more easily than darker colours, but don’t let this deter you from the lighter shades. All fabric will collect dirt in the end and some of the lighter colours are the most popular! Please note that a darker tone will result in slightly less available light underneath the shade, however it is very little and often goes unnoticed. If you are getting new metalwork (galvanized steel posts or frame) then you will also want to pick a powder-coating finish. This is an affordable way to improve appearance and corrosion resistance. Dulux has their latest 2017 paint range ‘Duralloy’, which is the go-to standard for powder-coating. When choosing your colour a nice technique is to try and tie in an existing feature, including gutters, fences, or other existing structures. Remember that simple and plain colours are often the best. It is almost impossible for the nonprofessional to make a shade sail that fits. This is because all shade material stretches under tension. In order to get a sail that fits perfectly, with even warp and weft tension all over, they should be designed and manufactured in 3-Dimensional software programs. By doing so you can achieve a strong and robust shade, and improve expected lifetime greatly. Welded seams, transference of 2D panels onto a plotter table, and dealing with complicated 3D designs – these are the types of things that can only be accounted for using available technology in a sail loft. Also it helps to have lots of experience in sail manufacturing and design! Trying to install posts in concrete, to fit a ready-made standard size shade sail, usually ends in frustration and tears. If you try to do things this way what you end up with is a sagging, flapping, pile of mess. A much better solution is to install all posts and fixings first, take exact measurements from point to point, then make a custom shade sail to fit. This shade sail shown here is an example of what a pre-made standard sized sail looks like, when you try and install posts to fit (this is not a Shadeform sail). No matter what you do, it will never line up quite right, and more than likely it will have to be replaced in a year or two. Avoid the hassle, it you install a shade sail properly it will last for 10 years or more! Spend some time and effort planning your next shade sail. Not only will you get a much better looking shade but you will get something that works from day one, with minimal maintenance, and lasts a long time. Some common issues include: structure not to specification, or incorrect footing sizes and post heights. 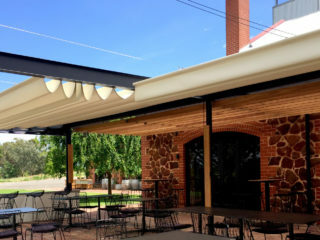 Shade Sails seem simple enough, but it is very easy to underestimate what it takes to design and construct a good shade. 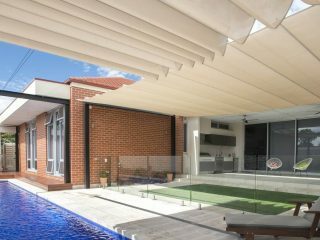 A quality Shadeform Sail is often engineered to Australian Standards, and constructed with the strongest materials and stainless steel fittings. Can I put it up myself? It isn’t recommended that you construct the actual shade sail yourself, because of the reasons outlined above. However for simple designs the handy person can certainly help out in some of the other phases of shade construction. 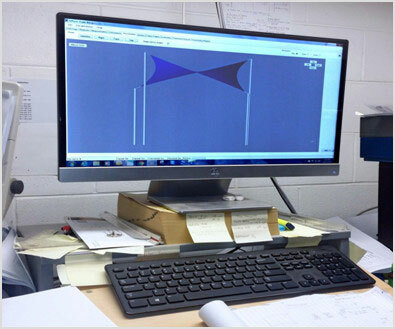 We find that a great deal of good designs come about when clients have an active input with their shade sail. A common arrangement, especially with remote jobs in the country, is that the client or builder will install the structure (posts and concrete) & then shadeform will manufacture the sail to fit. This way you can save a bit of money and receive a properly designed and manufactured shade, at the same time. Step 8: Do I need to go to Council? If you install a shade that is less than 20m2 in size, less than 3m in height, and doesn’t’t extend beyond your homes facade, then you should be able to install it without council approval. If you want to build a shade outside these guidelines (this includes waterproof sails) then you will need to go to council, and you’ll probably need engineering too. These rules vary between states and councils, so be sure to check with your local representative first. You’ll find most councils as quite happy to talk about options if you approach them in a friendly manner. If you would like to contact Shadeform for further help in this area, our team of designers and drafters have experience working with government personal and can streamline your building process. After moving to our current area, we’ve found an old shade sail at the back of our house. It’s still new, classy and simple, yet there’s a certain portion that needs to be repaired. I am thinking if we can combine it with other colors or just stick as to what it is. You can combine different colour panels, but typically this is only done with new shade sails. If the sail isn’t too old it could be modified, but still expect to pay some money as this is a lengthy process. Feel free to contact us if you need any help…! 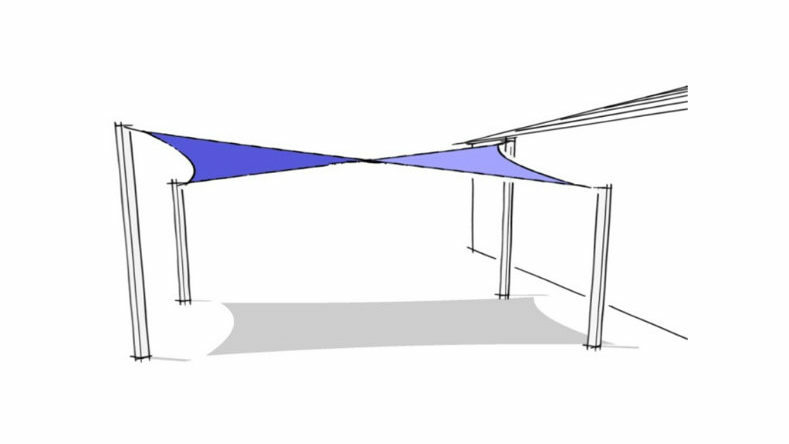 I think that there are no easier ways more than this ideas to make a perfect shade sail. Hey Josh, greatly appreciated and you have put some pleasant and effective points of making ideas of the shade sail. Thanks for publishing a brilliant post.